Monday July 02, 2018 – This year’s Melbourne Bus Vic Maintenance Conference and Trade Show will see Whites Diesels Australia side by side with Whites Commercial Vehicles. 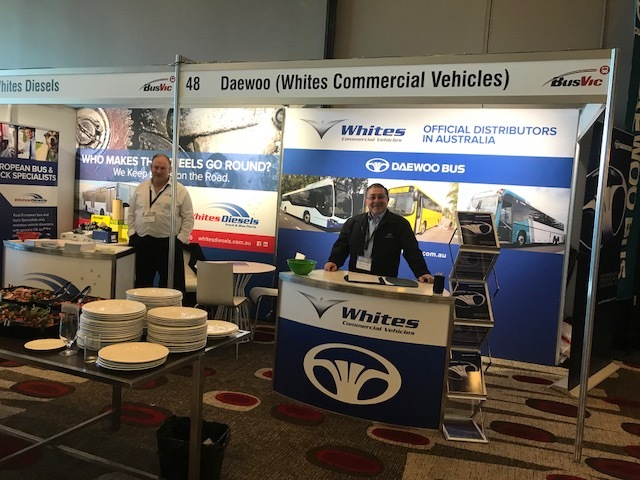 Whites Commercial is a fully owned subsidiary of Whites Diesels Australia, it will be responsible for all future bus and chassis sales, spare parts distribution, service and technical back up for our current and future Daewoo bus operators. Whites Commercial Vehicles will be headed up by Lou Riccardi, who brings to the team 30 years bus industry experience and will be responsible to drive the new venture forward. Whites Commercial Vehicles has negotiated with overseas and local bus body builders because of their ability to satisfy the unique needs of Australia’s harsh operating conditions, with a focus on quality, reliability and value for money. Whites Commercial Vehicles intends to develop buses of the highest standard. For more info about Whites Commercial Vehicles and Daewoo Buses, click here.